Risk management at the intersection of meteorology and food science. For any of those who ever grew up or lived in New England, any conversation about the weather invariably contained the phrase “if you don’t like the weather, wait a minute”. That was a testimony to the changeable nature of New England weather, but with a simple change of the time frame, it can apply to the conditions across much of the northern hemisphere, if not the globe. We have mused in this blog about the “changed background state” of the climate, with the Pacific Ocean moving more deeply into the negative phase of the PDO, and the Atlantic Ocean continuing to be in a positive AMO (see previous posts for more details). As a refresher, that has not been the case for much of the “advanced period” of climatic studies and by that I mean the time that coincided with the rapid development of satellite technology and its ability to cover an ever greater part of the globe to feed the insatiably hungry operational and long term models of both weather and climate. I say insatiably for even though we have advanced the global data coverage and significantly advanced the computational power to digest them, unless we have perfect global data coverage and of course the computational capacity to churn all that out in a useful time frame, the models must make some assumptions. And that is what makes them imperfect. Better every year yes, but imperfect nonetheless. As a lifelong meteorologist/climatologist I have throughout my career continually witnessed the disappointment with a “model” or forecast. It is clear market users expect a greater certainty in these forecasts than they are capable of delivering. That does not make them invaluable of course, just means there applicability needs to be driven by experience, not by output. Having said this, the key question becomes what will summer 2013 be like? As the last few summers have disappointed, are we stuck in a rut? Due? Neither? The focus is on the tropical Pacific (El Nino, La Nina, neutral?) and the global oceans. But as noted above, each year brings another opportunity to learn. There are a some relatively new terms out there, GLAAM comes to mind. It stands for global atmospheric angular momentum, though despite the catchy acronym it is not a staple of cocktail parties yet. GLAAM is not easy in the physical sense to describe. But in research done by some (notably at CWG)…and what follows are my interpretation…it indicates to what degree the state of the tropical pacific will “connect” with the global climate system. Thus, it may be El Nino or La Nina like, but if the “circuit” is turned off, the expected impact will not be felt. Thus is but just one example of the continual evolution of the climate system, especially as regards the ability to forecast in the 3 week to 3 month timeframe. A scant twenty years ago researched focused in “fixed” ocean temperature areas or patterns and were able to discern a few signals….but these fixed patterns showed up infrequently leaving many years as “no significant signal” discerned. Now a warm pool in the central Pacific means something very different from the eastern Pacific, and even more so depending upon what months these occur in. Same for the Atlantic and for the tropics, GLAAM, ENSO, etc. So, from this vantage point, the climate continues to be more “extreme”, being dictated by the background state referred to in the opening. Droughts, late frosts, currently excessive wetness….and at some point in time early frosts, droughts elsewhere. Do not construe this as a forecast that these will occur every year….but the historical record will tell you under certain “longer term” background states, they are more common than we have been used to in the last 30 years. Forecasts of all kind are slowly but surely better. But in a nod to the imperfection noted earlier…..”every theory on the course of events in nature is necessarily based on some simplification of the phenomena observed and to that extent is therefore a fairy tale”. – Sir Napier Shaw, Manual of Meteorology. You’d be best to bear that in mind. As we wind down out of another high amplitude winter, many of the climate forcing signals are now neutral or too weak to have an impact on the daily sensible weather. Before examining current conditions, let’s remind ourselves where we have been and why. This past winter, and in fact the seasons before it, were dominated by extremely “blocky” flow, as the ocean basins of both the Pacific and Atlantic are in long term states that have a tendency to support such patterns. Superimpose on this pattern a “La Nina” like state of the tropical pacific, and we had a pattern that produced the drought in the US Midwest last summer and periods of dryness in Argentina this past growing season. Make no mistake about it, these events are not unrelated, but are a manifestation of the current climate regime. The winter continued to see a strong blocking pattern, which is why mother nature has been reluctant to loosen old man winter’s grip. You may also have taken notice of late freezes/cold spells across many different regions of the globe….from Argentine soy in March, the US wheat/early corn in the plains and deep south, to the current cold wave across Europe impacting winter wheat yields. Again, these are not unrelated. They are the state of the current climate system. Whereas we had decades of mostly zonal flow that resulted in few major crop problems from 1985-2005, we now will have a period of “blocking” flow. Crop disruptions will revert to their long term mean, growing seasons will be at risk for slow starts and abrupt ends. Some of the most devastating freezes in US growing areas occurred in the 1970/80’s. It is not new, just the old adage the what is old is new again. As regards the current state of the climate, we remain in the background state of predisposition to blocking patterns. However, the transitions from winter to springs are almost always like a staggering drunk, first this way, then that way, and so on until the final destination is reached. In our case, that final destination will be the established pattern that will dominate the summer weather in 2013. As of now, the short to medium term climate forcings that interact with the background climate state, are very weak or non-existent. The tropical Pacific is hovering around the neutral state, flirting at times with La Nina (more blocking/less rainfall) and El Nino (less blocking/more rainfall). The Madden-Julian Oscillation (MJO), which cavorts around the globe and enhances/suppresses convective responses, plays a meaningful role in predicting weather in the 2-4 week time frame. However, right now the MJO is too weak to lend any guidance. As is the tropical pacific. Thus, the atmosphere is a bit more chaotic and a bit less unpredictable. Rains can fall in just about any place, as no “locking” or “blocking” mechanisms are in place. From this, we are at risk of being lulled to sleep. The March-May period is notoriously unreliable in the tropical Pacific, and the MJO will not stay weak forever. The good news is we can plant US crops more/less on time, though decidedly behind last year’s record pace. However, the prospects for the summer remain wide open, and we have only the background state to rely on, one that is pre-disposed to blocking patterns. This is not a forecast of another crop problem, just a reminder that on climate scales, weeks and a month or two are not meaningful changes. The evolution of these parameters between now and end of June will determine crop fates not just in the US but globally. This pattern has taught us since 2010 to be respectful. That is what I currently am doing….. Global climate conditions continue to behave as previously discussed, with the tropical Pacific very reluctant to move into an El Nino state, and instead having a current pre-disposition towards favoring La Nina’s. The primary driving force for this, and I say primary for as with climate no single force alone can be adequately used as a predictor, is the negative state of the Pacific Ocean, called the PDO (Pacific Decadal Oscillation). A positive PDO has warmer waters in the equatorial Pacific and colder waters in the North Pacific, while a negative PDO has cooler waters in the equatorial Pacific and warmer waters in the North Pacific. From the above description, intuitively it makes sense that El Nino’s have an “easier” time of it in positive PDO (warmer pool of water near the equator) and that La Nina’s have an “easier” time of it during negative PDO (cooler pool near the equator). Many climate models in early to mid-2012 were predicting an El Nino to occur by year’s end, and indeed the tropical Pacific warmed, but never had enough to do much more than that, and in fact we are now on the threshold of another La Nina, as the tropical Pacific has cooled yet again, though currently stalled at the moment. A further bit of La Nina strengthening is expected again as we head into boreal spring, and that is not necessarily good for mid-latitude row crops. Thus, we are faced with the possibility of additional supply problems in 2013. This is not to say that El Nino’s cannot occur in negative PDO, the historical record shows that they most certainly can. However, it takes a more complete synchronization of the multiple forcing factors in this type of climate regime to initiate one. At times in the 1950’s and 60’s, (last period of prolonged negative PDO), the tropical Pacific went 5-7 years without an El Nino. The state of climate forecasting is not advanced enough to make this bold a statement, but it has been a number of years already. 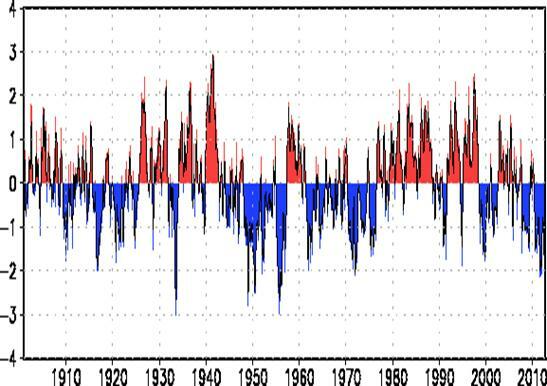 Once again, several climate models are forecasting an El Nino by the end of 2013. Will this be the time the models get it right? In any event, that is a good 9-12 months off, and for the balance of the already in progress Southern Hemisphere growing seasons and the upcoming Northern one, the background climate signal for 2013 will be mostly similar to that of the last few years. As major droughts have struck globally in each of those years, we must remain on alert that such a possibility exists. As of this writing, after a very wet start to the growing season in the southern part of South America, dryness has set in from mid-December onwards, and the prospect for soaking rains in tenuous at best through mid-February if not the whole month. As “unusual” as this seems to repeatedly have major crop issues, as this was not the case during the positive PDO “global warming” period of the last 30 years….let me repeat this for emphasis…the period from the mid-1980’s until several years ago was notable for its ABSENCE of devastating crop failure with very few major mid-latitude droughts nor Asian monsoon failures…..the current pattern resembles more the period around the 1950’s and 1930’s….which were quite notable, as history attests. As persons with vested interests in agriculture, we do not have the luxury of worrying about 50-100 years in the future when pressing problems face us in the present. As relates to climate prediction, a twist on an old phrase…”those who choose to ignore the past, will miss the future”. In the song Subterranean Homesick Blues, Bob Dylan rasped (some say rapped) “you don’t need a weatherman to know which way the wind blows”. That’s true enough, but you might want one to tell you why it blows the way it does, and that’s what I’m going to attempt here. You may recall from the last post a discussion of climate indices and their interactions on influencing weather in the tropics. We will divert our focus poleward here and talk about the relationships between climate indices and the weather in the mid-latitudes, or the regions of the world where many of the key global crops are grown. We will start with the jet stream, a constantly moving river of air some 4-7 miles above the earth’s surface. The jet stream is a manifestation of the ‘battleground” where cold/dry polar air meets warm/moist tropical air in a Sisyphean attempt to equalize the temperature contrast between the equator and the poles. As a crude approximation, the jet stream flow is described as being either zonal or meridional. 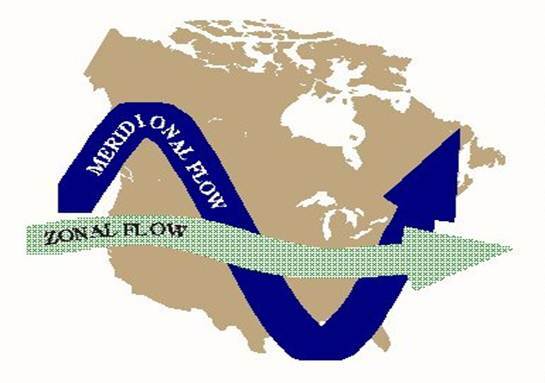 Zonal flow (see picture) is predominantly west-to-east flow and is often called “flat” flow. It methodically marches the energy of the jet stream and its attendant storms at a regular pace, and thus brings alternating periods of storminess and clear weather. A common feature of zonal flow is that no one particular aspect of the weather remains static in one place over an extended period of time, avoiding the extremes that often plague agricultural production. By contrast, meridional flow (also see picture) has a more pronounced north to south component of the flow, and is often associated with persistent blocking of the jet stream flow, resulting in strong ridges of high pressure and deep troughs of low pressure. These patterns may also be transitory and when they are they result in wild swings of weather or they may become stationary, and unleash a period of persistent weather….be it drought, floods, heat waves or cold snaps. This type of pattern, a persistent meridional flow, are the enemies of crops in the mid-latitudes, most recently as evidenced by the US Midwest drought of 2012. So, the goal is to look for patterns in the myriad of global climate indices….in sea-surface temperatures , global circulation patterns, solar outputs….for clues as to the predictability of zonal (more crop friendly) and meridional (more crop unfriendly) flow regimes. And there are a few suggestions to be found there. In the last post we discussed the role the PDO (Pacific Decadal Oscillation), its 20/60 year periodicities and how it has shifted to negative PDO (see below). To that, we will add the AMO (yes, the Atlantic Multi-Decadal Oscillation, not to be outdone). The predominant periodicity of the AMO, shown above, is 60-80 years. Before we get too carried away, keep in mind we are working with limited datasets and our understanding of these indices is incomplete. Nonetheless, a review of the charts below show that during periods of negative PDO and positive AMO ( for instance the mid 1930’s, the 1950’s and the last few years) were periods when significant disruptions to climate and food production occurred globally and especially in the US. 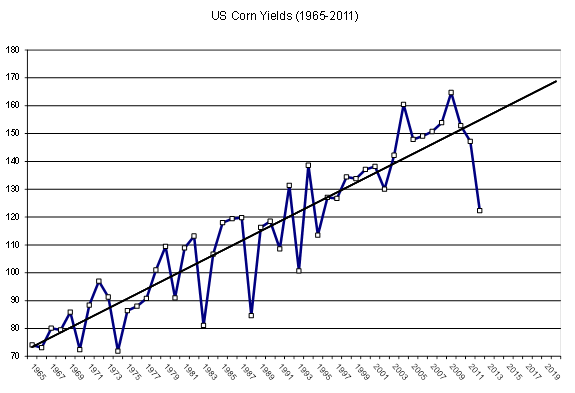 We these days find ourselves bombarded with popular press stories about runaway warming and tipping points in climate, yet a chart of US corn yield deviation from trend shows that the frequency of highly variable yields was greater in the period around the 1970’s than in the 1990’s, punctuated by the drought of 2012. So, the working hypothesis here is that the period of generally benign weather for mid-latitude agriculture has come to an end as the climate system shifts gears and in doing so will promote on average a greater frequency of meridional flow, resulting in droughts, floods, heat waves and cold snaps. Embedded in that last statement is the length of the growing season, which has slowly been increasing and providing very favorable conditions for agriculture…all under an extended regime of zonal flow. Meridional flow will also increase the possibility of early and late frosts, and begin to take away those extra growing season days gained over the last few decades. Since 2010, a major crop failure has hit in three different regions of the world every year. In 2010, it was a phenomenal drought over Kazakhstan/Ukraine and neighboring areas. In 2011, it was Argentina and southern Brazil (note that weather disruptions in SA prior to the late 1990’s would not have impacted global food production significantly, yet now it will, another new wild card). And this year, the US Midwest. Despite that, this is not meant to predict a disaster every year, that is not consistent with the historical record. But they will become more frequent, and the volatility in global commodity markets will continue. Now more than ever, risk management expertise and discipline will be required. Are you and your organization prepared? Climate and its ultimate offspring, the weather, remain one the most important, contentious and in my opinion mis-represented features of the global landscape. The great drought of 2012 reminds us of that. Sure, geo-political and macro-economic events are almost always more press-worthy, but climate and weather are always there, always in motion and always working to deliver a unique combination of variables that remains just out of the grasp of researchers today. Lest you think I am disparaging climate research, far from it. But I believe it is best to characterize it as several steps forward followed by several steps backward, which is to say that the answer to one question almost always generates another or several more questions. That is the power and beauty of science! But climate science has made outstanding leaps in the past 50 years, not in the least because of the advent of satellites and the capabilities to collect a more robust spectrum of data from around the globe, especially the oceans. ENSO (El Nino/Southern Oscillation) makes regular headlines these days, but back in the late 1970’s it was strictly a topic for academic researchers. 1982/83 changed all that and brought ENSO to the forefront. 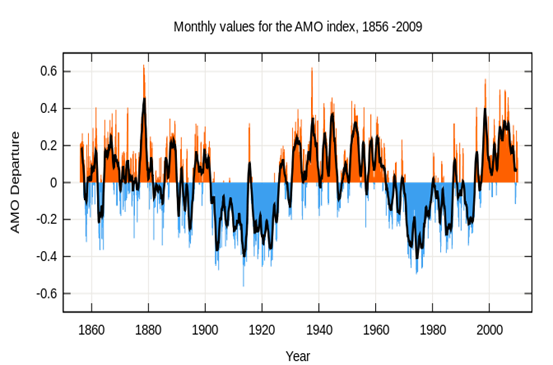 Historical data and climate models now show relationships between ENSO (climate) and weather. But they are, as are all attempts at modeling the atmosphere, imperfect….which reminds me of one of my favorite quotes….”Every theory of the course of events in nature is necessarily based on some simplification of the phenomena and is to some extent therefore a fairy tale” – Sir Napier Shaw: Manual of Meteorology: I, 123. So where I am going with this? Simply enough, I want to remind people that, despite what you hear in the press almost every day, much much less is known about the climate system than you are told to believe. It is human arrogance that leads us to believe with perhaps a few hundred years of global land data, a half century of satellite data, and limited ice cores and tree rings from millenia, that we really understand what is going on in the climate system. Case in point today is with the Pacific Decadal Oscillation (PDO). The PDO is sea surface temperature dipole in the North Pacific, of which records go back to just over 100 years ago (in other words, insignificant in the climate history of planet Earth). But as stated above, we are continuing to learn how these medium to long term climate oscillations interact with shorter term climate oscillations (ENSO) and a myriad of other variables the ultimately govern the winds on this planet. As a slight detour, here are some other climate indices: AMO (Atlantic Multi-decadal Oscillation), IDO (Indian Dipole Index), AO/NAM (Arctic Oscillation/Northern Annular Mode), NAO (North Atlantic Oscillation), SAM (Southern Annular Mode), QBO (Quasi-biennal Oscillation), Solar Flux/Sunspots, etc. Complex indeed. But back to the PDO. It has multiple periodicities of approximately 20 and 60 years, which are incompletely understood. But we can surmise that a positive PDO (left picture) has on average a greater abundance of warm water in the tropical Pacific to support El Nino’s and that as such they will be more frequent and more intense on average in the phase. The converse is true of the negative phase. On average cooler waters will support less frequent and intense El Nino events, and more frequent and intense La Nina events. Why do we care about this? Because El Nino/La Nina have differential impacts on the global weather. Despite the localized devastation that El Nino wreaks, in general La Nina tends to be more damaging to global agriculture, and we are entering a period of the negative phase (recall 20 and 60 year periodicities, so we are here for a while) and will on average tend to have a greater risk of threats to agriculture than not. Also note a warm tropical Pacific, given its expansive reach, also generally warms the planet. The extended growing seasons, the almost unbelievable run of the Indian Monsoon in the last 25 years (much fewer failures than before), and the relative absence of crippling US droughts in the same time frame…until this year…should remind us that the last several decades have seen less climatic disruptions in key areas than prior periods. Thus, the high prices and more importantly the extreme price volatility will remain a feature of these markets, and more so than ever will demand an integrated disciplined approach to managing risk, from farm-gate to table. If you don’t know, understand and manage your risk, then without a doubt the market will do it for you. It is not a sufficient strategy to hope for good weather. The grain markets of 2012 have spoken, and in fact are not done speaking, but the real question is ,who is listening?